For over 100 years Oxford World’s Classics has made available the broadest spectrum of literature from around the globe. Each affordable volume reflects Oxford’s commitment to scholarship, providing the most accurate text plus a wealth of other valuable features, including expert introductions by leading authorities, voluminous notes to clarify the text, up-to-date bibliographies for further study, and much more. You can follow Oxford World’s Classics on Twitter, Facebook, or here on the OUPblog. Subscribe to only Oxford World's Classics articles on the OUPblog via email or RSS. After Gwendolen Harleth’s encounter with Daniel Deronda in Leubronn in Chapters 1 and 2, there’s a flashback to Gwendolen’s life in the year leading up to that meeting, with Chapters 9 to 11 focusing on the Archery Meeting, where she first meets Henleigh Grandcourt, and its consequences. In the England of the past archery was the basis of military and political power, most famously enabling the English to defeat the French at Agincourt. In the later nineteenth century it is now a leisure pursuit for upper-class women. This may be seen as symptomatic of the decline or even decadence of the upper class since it is now associated with an activity which Frith suggests is “trifling and commonplace.” A related symptom of that decline is the devotion of aristocratic and upper-class men, such as Grandcourt and Sir Hugo Mallinger, to a life centred on hunting and shooting. The Frith painting shows a young female archer wearing a fashionable and no doubt extremely expensive dress and matching hat. This fits well with the novel for Gwendolen takes great care in her choice of a dress that will enhance her striking figure and make her stand out at the Archery Meeting, since “every one present must gaze at her” (p. 89), especially Grandcourt. The reader may similarly be inclined to gaze at the figure in the painting. One might say that together with her bow and arrow Gwendolen dresses to kill, an appropriate expression for arrows can kill though in her case she wishes only to kill Grandcourt metaphorically: “My arrow will pierce him before he has time for thought” (p. 78). Readers of the novel will discover that light-hearted thoughts about killing Grandcourt will take a more serious turn later. With the coming of Grandcourt into the Wancester neighbourhood through renting Diplow Hall, the thoughts of young women and especially their mothers turn to thoughts of marriage – there is obvious literary allusion to the plot of Pride and Prejudice in which Mr Bingley’s renting of Netherfield Park creates a similar effect. 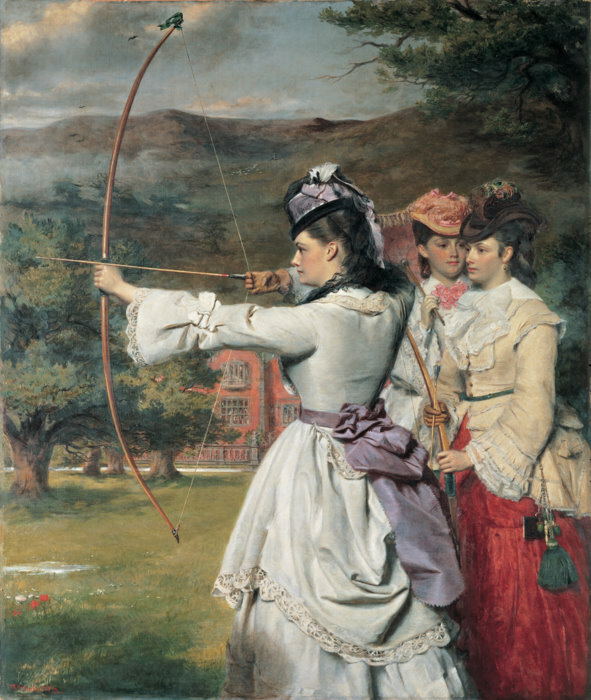 The Archery Meeting is the counterpart to the ball in Pride and Prejudice since it is an opportunity for women to display themselves to the male gaze in order to attract eligible husbands and no man is more eligible than Grandcourt. Whereas Mr Darcy eventually turns out to be the perfect gentleman, in Eliot’s darker vision Grandcourt has degenerated into a sadist, “a remnant of a human being” (p. 340), as Deronda calls him. Though Gwendolen is contemptuous of the Archery Meeting as marriage-market, she cannot help being drawn into it as she believes at this point that ultimately a woman of her class, background, and upbringing has no viable alternative to marriage. While Grandcourt’s moving into Diplow Hall together with his likely attendance of the Archery Meeting become the central talking points of the neighbourhood among Gwendolen and her circle, the narrator casually mentions another matter that is being ignored – “the results of the American war” (p. 74). Victory for the North in the Civil War established the United States as a single nation, one which would ultimately become a great power. There is a similar passing reference later to the Prussian victory over the Austrians at “the world-changing battle of Sadowa” (p. 523), a major step towards the emergence of a unified German nation. While the English upper class are living trivial lives the world is changing around them and Britain’s time as the dominant world power may be ending. 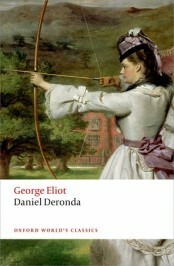 Though the eponymous Deronda does not feature in this part of the novel, he is in implicit contrast to Gwendolen and the upper-class characters as he is preoccupied with these larger issues and uninvolved in trivial activities like archery or hunting and finally commits himself to the ideal of creating a political identity for the Jews. When he tells Gwendolen near the end of the novel of his plans, she is at first uncomprehending but is forced to confront the existence and significance of great events that she previously had ignored through being preoccupied with such “trifling” matters as making an impression at the Archery Meeting: “… she felt herself reduced to a mere speck. There comes a terrible moment to many souls when the great movements of the world, the larger destinies of mankind … enter like an earthquake into their own lives — when the slow urgency of growing generations turns into the tread of an invading army or the dire clash of civil war” (p. 677). She will no longer be oblivious of something like “the American war.” By the end of the novel the reader looking at the painting on the front cover may realize that though this woman who resembles Gwendolen remains trapped in triviality and superficiality, the character created in the mind of the reader by the words of the novel has moved on from that image and undergone a fundamental alteration in consciousness. K. M. Newton is Professor Emeritus at the University of Dundee. He is the editor, with Graham Handley, of the new Oxford World’s Classics edition of Daniel Deronda by George Eliot.